Aga Khan Museum exhibit features giant moon sculpture 2019-03-24 | Ismaili.NET - Heritage F.I.E.L.D. A must-see highlight of the exhibition is contemporary British artist Luke Jerram’s giant sculpture, Moon. 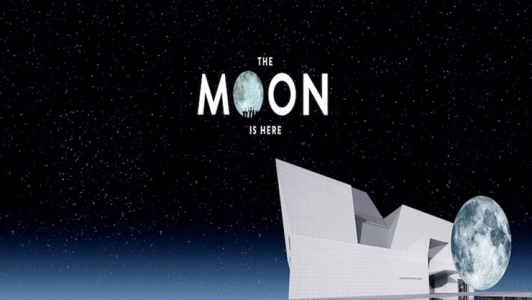 Spanning two floors of the museum, the internally illuminated orb features detailed NASA imagery of the lunar surface. An accompanying sound composition by Dan Jones — a composer who has won a British Academy of Film and Television Arts award (BAFTA) — adds to Moon’s otherworldly experience. Underneath this sculpture, the poetry and spoken-word series MoonVerse will host a diverse range of artists. It takes place every Wednesday in April, and it’s free to attend. Other related programming includes a talk about the moon’s role in Islamic astronomy and a one-day celestial jewelry workshop. Tickets are also available for a night of jazz with sextet Two Rivers (April 6), Zahra Noorbakhsh’s standup comedy (April 12 and 14), a live taping of the podcast #GoodMuslimBadMuslim (April 13) and a qawwali performance by Pakistan’s acclaimed Hamza Akram Qawwal and Brothers (April 19).